It is beyond doubt that Deepika Padukone and Sabyasachi Mukherjee make a fabulous team and are a force to reckon with. Why do we say so? Well, because the ace designer breathes life into his creations and Deepika on the other hand, brings alive the beauty and hard work he puts behind the designs. Having already teamed up together for several occasions, Sabyasachi has this time, styled Deepika in his latest collection - #SabyasachiForNilaya . It is a range of designer wallpapers from Sabyasachi, at Nilaya by Asian Paints, that has been inspired from his forever love - Calcuta. While the wallpapers are nothing like what we have seen before, we couldn't help to take our eyes off of the sarees, jewelry and the ethereal beauty that is Deepika. She is spotted in 3 completely different head-to-toe Sabyasachi looks which are totally steal-worthy and a major inspiration for this wedding season. In the first look, the actress exudes regalness and looks divine in a breathtakingly beautiful peach-pink heritage Benarasi saree with a Marori border, paired with a matching ric blouse. She has completed the look with a statement neck piece with red jewels and a maang tika that resembles a borola. In the second look Deepika looks like a painting in a classic Sabyasachi saree, paired with those stunning jhumkas from the Sabyasachi Heritage Jewellery collection. 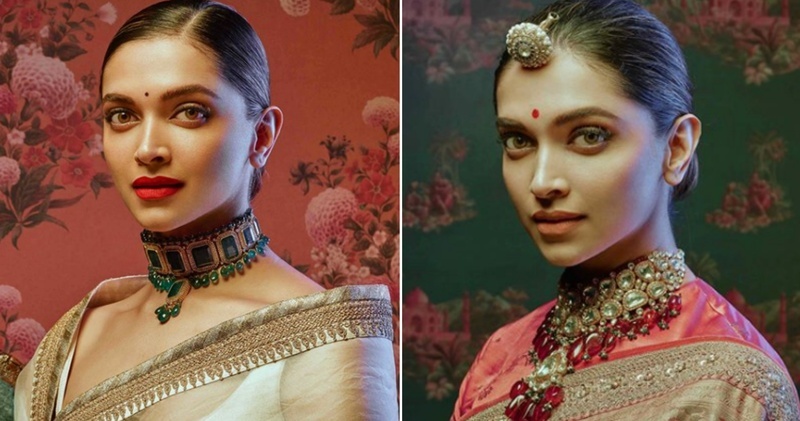 In the third look Deepika looks like a modern day princess opting for the off-white Sabyasachi six-yard wonder paired with an eye-grabbing emerald choker from the Sabyasachi Heritage Jewelry collection. For this he says, “If you grew up in Bengal at the time I was growing up, sometime between late seventies and early eighties, you would know that the consumer was the designer. Stunning isn't it? We too are taken with the beautiful designs and the magic only Sabyasachi can create and the beauty that Deepika is. Also, we say these looks will be a hit during the wedding season and if you are feeling a little creative, create your own personal spin on them and see the magic unfold!